Were you looking for the Jiralhanae Prowler? The prowler is a variety of stealth-capable corvettes within the UNSC Navy. Prowlers are used by the UNSC Navy for stealth infiltration/exfiltration, to gather electronic intelligence gathering, and minelaying operations. Most prowlers are crewed by Office of Naval Intelligence personnel serving under the Prowler Corps, with only a few ships operated by FLEETCOM. Most prowlers are designated with the hull classification symbol PRO, followed by a numeric designation. Although most prowlers are classified as corvettes, the term can be used to refer to a stealth ship of any size; the stealth cruiser Point of No Return was noted as being the largest prowler-class vessel ever built. The prowler's primary role is to stay hidden while safely gathering battlefield intelligence, avoiding direct combat due to its light weapons and armor. Because of their tactical value and potential to change the outcome of any given combat situation, every UNSC battle group has at least one prowler assigned to its ranks. The prowler's only combat role, besides active combat monitoring and recording, is discreetly laying cloaked fields of HORNET nuclear mines in orbital regions. Prowlers must have the capability to hide even within their own fleet to avoid being tracked in the event a UNSC ship fell into enemy hands. A typical prowler has a crew of 90, although the craft can operate with a far smaller crew or entirely autonomously with an onboard smart AI. Prowlers avoid detection through the use of physical features designed for low observability, low-profile sensor systems, and an array of stealth systems intended to mask the ship from both visual and sensor detection. The outer hull is coated with stealth ablative coating, which hides the ship's radar signature and acts as a simple form of active camouflage. This camouflage is maintained by a system known as the texture buffer. Engine emissions are hidden via the use of heat sinks and systems known as ablative baffles and engine dampers, which enable the prowler to appear to sensors the same temperature as the surrounding space, thus avoiding detection by infrared-range sensors. Because prowlers inevitably release some emissions, their systems are designed distort their signatures to appear as wreckage, low-threat vessels, or even friendly craft. A prowler is able to stay in stealth mode for days or weeks, although they are not fully undetectable. Past fifteen minutes in a combat theater, detection by Covenant sensors is noted to grow at a geometric rate. Prowler captains receive extensive training in the use of astronomical objects to their advantage in hiding their presence, as well as the deployment of drone networks to maintain concealment during missions. There is also a tradeoff between speed and stealth, and prowler commanders are forced to walk a fine balance when optimizing their stealth systems and engine power. The active camouflage systems of Covenant War-era prowlers were crude in comparison to Covenant active camouflage, operating on a seemingly similar principle as the SPI armor's photoreactive panels. For example, the UNSC Wink of an Eye's stealth coating was fairly unstable, making the ship waver to and from visibility uncontrollably especially when exposed to rapidly changing backgrounds, such as the clouds of a gas giant. However, over the course of the war, research into Covenant technology allowed the UNSC to develop more effective forms of cloaking, namely a form of camouflage field which surrounds the ship similar to Covenant active camouflage. The reverse-engineering of active camouflage systems and limited integration of Forerunner baffler sensor distortion technology has enhanced the vessels' inherent stealth capabilities, allowing prowlers to avoid or defeat detection techniques that the Covenant had developed during the war. Prowlers are equipped with a wide variety of sensor equipment and electronic warfare devices, many of them mounted in a sensor array located in the craft's nose. The ships possess an X-ELF radar system, a mass spectrometer, lidar, as well as EMP dampers which isolate the ship's electronics in the event of electromagnetic pulse strikes. The post-war prowler UNSC Port Stanley was upgraded with a high-fidelity real-time holographic mapping suite which enables the generation of highly accurate images of a given area when working in concert with the prowler's subsidiary drones and other sensors. Prowlers are equipped with a number of deployable BLACK WIDOW communications satellites to provide sensor and communications coverage in a local operations theater. A prowler's primary offensive armament is an array of HORNET nuclear mines with vacuum-enhanced loads and a dedicated chamber to cool them down to the temperature of the vacuum of space. However, it is impossible to maintain stealth when exiting slipspace with nuclear weapons onboard, as they emit a detectable Cherenkov radiation flare upon transmission from slipspace to normal space. As a result, prowlers are forced to jettison their nuclear mines into slipspace if a cloaked exit is necessary. 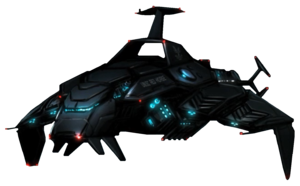 Prowlers also possess a pulse laser weapon and can be equipped with more powerful weaponry, such as Shiva or Rudra-class nuclear warheads. "Subprowler" is an informal designation for stealth-capable smallcraft – often deployed by larger prowlers – that are used to infiltrate and exfiltrate personnel and cargo from planetary surfaces. Though designed with low-observable technologies, subprowlers also feature a series of electronic countermeasures and decoy capabilities that increase their survivability in the dangerous period when entering and exiting atmospheres, or when operating near advanced aerospace defenses. Red Horse navigates Installation 04's debris field. Red Horse releases a Pelican dropship from her ventral launch bay. ONI Acrisius, a Winter-class prowler stationed aboard the Argent Moon.